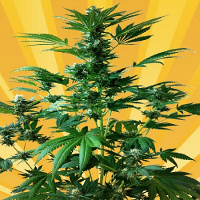 Power Kush feminized marijuana seeds were developed by the Dinafem Seeds through numerous inbreeding experiments for everyone who wants a quick result in both growing and stone. Favorite in Amsterdam coffee shops, Power Kush marijuana seeds are quick to mature and produce heavy crops of frosty buds with powerful physical and mental high. 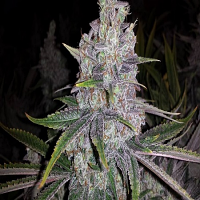 Feminized seeds of this strain are agreed to be the most endogamic, a single original Power Kush mother plant grown over many years in Dinafem’s laboratories has provided descendants which are all grandchildren of that one plant. For that purpose, S1 seeds, or self-pollinated first generation seeds were created. These seeds were cultivated and later selected, aiming to keep plants which were similar to the mother plant, which was an indica hybrid, used for commercial production supplying Amsterdam coffee-shops. The best two of these S1 daughter seeds were selected and their cross finally made this feminized seed of Power Kush. These feminized seeds equally share indica and sativa genotypes and possess the highest qualities of both strains – it takes only from 45 to 55 days of flowering to receive a fantastic yield. 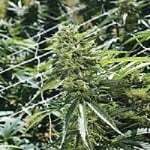 Cannabis growers report 500+ gr. depending on growing conditions. 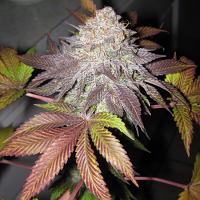 The long inbreeding gives greater stability to these marijuana seeds, which in addition to the vigor of the strain, provides this Afghani Skunk with a very predictable and commercial result. 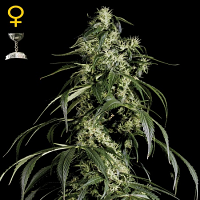 Suitable for indoor and outdoor cultivation, feminized seeds of Power Kush grow well and fast producing very attractive plants with mostly sativa growing patterns, they can reach 3 m high when grown outdoor, have big, wide and long leaves, so the plant can make the most of the light. They flower quickly, producing a high harvest of buds covered in white and orange hairs, an abundance of resin and a sweet skunk smell with a light touch of orange and strawberry. Outdoors, the harvests starts already at the end of September. Power Kush marijuana contains between 12 and 16% of THC with a physical and mental high, the strength is astonishing but no real coincidence if we take into account that skunk was the queen of Holland during the 90s and was developed quickly to produce great quality that has been maintained as much as possible to the present day.